So true! I had to move my studio to the basement over Christmas to make room in the dining room, and it's now in a space with zero natural light. Thank goodness for Ego lights. I just started food blogging, and after just one week I can relate to almost everything on the list. It's totally addicting, I hope my husband can get used to eating cold food. I do, though, give him the "prettier" plate. oh boy, numbers 5, 7 and 8 are painfully true. great insight - i needed a smile tonight! I loved your first post and this one is just as good. 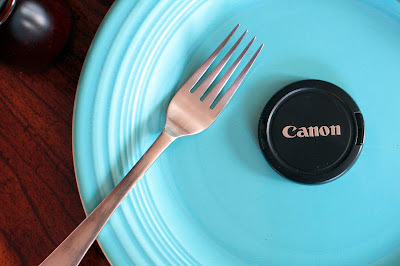 I don't even attempt to photograph and blog dinners. First my three children would riot and the second is my photos still need a ton of work (savory foods are not easy to make attractive). The first post was great and the second one is even better! My current trick (we still have the long summer evenings here) is to serve husband and daughter, then take the blog item out to the deck for its closeup. They're still yelling, "Stop taking pictures and come in and eat!" but at least their mouths are full some of the time. I'm telling you, we should have a food bloggers' convention! Think how much food that would be! OMG, these are totally true! My husband patiently waits while I photograph every food thing I come across. Same with my kids and cookies. Wow! What a great post - It's all so true! I usually have company over when I'm cooking something, since only 2 people makes for some serious leftovers, and am always trying to secretly snap photos without them noticing. They all know about my food blogging, but it's embarrassing to have them try and "pretty up" the plate or give suggestions on where to take the picture. I had one friend actually grab the camera and go on a spree! So true, and so funny! It's all so true. My son once asked, when I served him a hot dog for lunch, "Aren't you going to take a picture, Mommy?" At least I don't feel alone after reading this. I thought my husband was the only one feeling neglected. Thank you for this post! I can't wait to show my fiancee. He thinks I have a major problem with the biggest symptom being the fact that I bake cakes simply to take photos of them. I got my kids those little digital cameras for Christmas...V-Tech or something. Anyway, Christmas morning after all the presents were unwrapped, I found my 5 year old in the kitchen taking pictures of her food because "she was going to blog about it later". LOL. God love them! All items on your list are so true and so funny! Around my house it is when I yell, "Don't eat that yet! I'm waiting for better light to take the pics!" that I get groans and grumbles from my three guys. They also "love" the post-it notes on food in the fridge and freezer. I am in complete agreement with Barbara! People think I'll blog about anything and everything and when I don't take photos, they get offended! Loved both your posts. I completely agree that significant others put up with a lot! I even posted about this a while ago... maybe some subconcious guilt over what I was putting my boyfriend through at meal time.